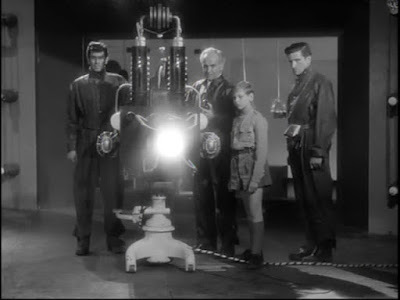 The Gamma People is set in the mythical European “Iron Curtain” region of Gudavia. The scientist dictators of this Gudavia have been using gamma rays in an effort to create a race of genius super humans. However, they have merely managed to produce emotionless and mindless brutes. 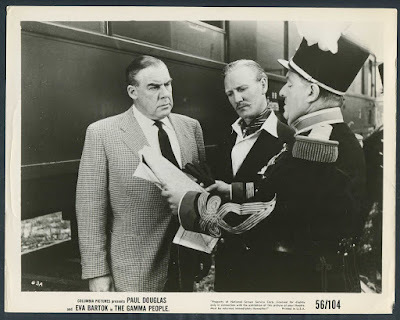 The American newsman, Mike Wilson now takes up the story in his special feature article in which he describes how he and British photographer, Howard Meade stumbled into this nightmare……. 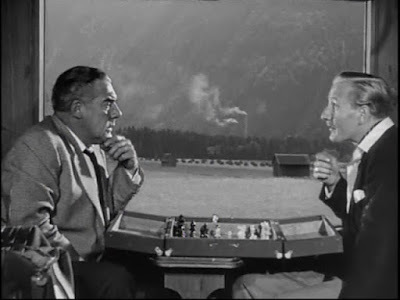 A few weeks ago I found myself aboard a train travelling through the snow-covered European countryside, playing a game of chess with my colleague and friend, photographic journalist, Howard Meade. Not my idea of a thrilling time I thought to myself as Howard kept rambling on about something or other he did back in Bulgaria. Unknown to us, an opening move in the larger chess game of life was about to begin as the carriage we were traveling in became uncoupled from the rest of the train with the result that the engine had forged ahead, while our detached carriage and its two unsuspecting occupants blithely continued roll on, Apart from a slight juddering sensation, there was little to indicate that our carriage had accidently smashed through a customs check point for the little and until now largely anonymous region of Gudavia. Yes, I said Gudavia!. Now try finding that on a map! It turned out that a couple of the local lads had caused our carriage to be diverted onto a siding when they threw a rail switch. Well, this little twist of fate would not only set in “train” a host of surprises for us, it would also cause a measure of confusion and wonder for the inhabitants of Gudavia. 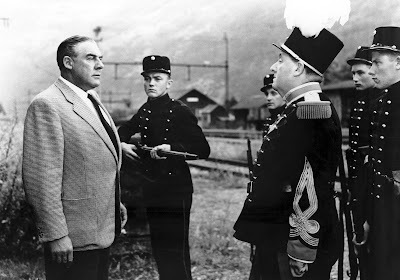 You see, there had been no trains in Gudavia for five years due to government decrees! It turned out that it was not only trains that were in short supply…. Anyway, our carriage eventually rolled to a halt, and Howard and I found ourselves confronted by a delegation of government troops. I attempted to explain that we were on our way to a music festival in Salzburg. This explanation didn’t seem to wash with our welcoming committee and matters were made worse when we realised that try as we might, we just couldn’t locate Gudavia on a map. 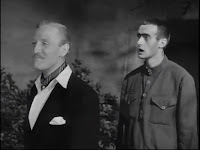 Not only were Howard and I in a country that to all intents and purposes was cut off from the outside world and apparently did not exist, we were provided with accommodation in the local jail at the insistence of a pompous fool of an official by the name of Commander Koerner. So there we were: presumed spies, our fate not known to the outside world and without any kind of diplomatic or consulate protection. It wasn’t long before events seemed to turn in our favour when that Koerner fellow came to release us from jail and proceeded to faun and fuss over us. The commander took us to the local hotel where we were to receive the best service and were offered the bridal suite no less! 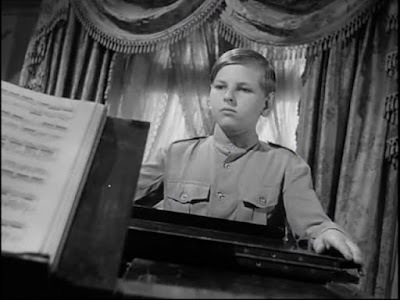 A more sinister mind set began to reveal itself at the hotel when we came across a girl by the name of Hedda playing the piano whose performance at the key board absolutely transfixed us. Suddenly a boy called Hugo Wendt, who had been watching Hedda play, ordered her to stop playing. He then harshly instructed her that music is not an exercise of emotional expression, but is something that obeys strict recurring rules and patterns. The brutal reaction of this juvenile Hitler merely caused the girl to burst into tears. 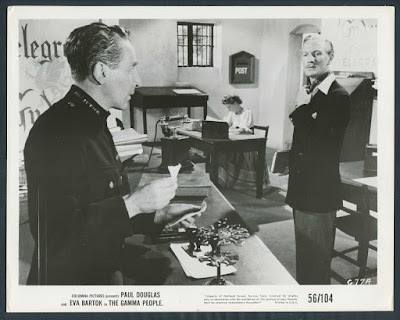 As we were shown to our room, one of the staff called Anna slipped us a note with a message stating that the children must be saved and that the man in charge, a Dr Boronski must be destroyed. Naturally we dismissed it as being absurd. I then proceeded to contact my office in London by phone. No surprises that I was given the run around there! Suddenly we were startled by a woman frantically screaming "murder, murder!" in the street below. We decided to go down and investigate but instead of finding a woman in distress, we bumped into that idiot, Koerner. He assured us that what we heard was merely the result of hysteria caused by an accident to a local child. Koerner then informed us that Dr Boronski would see us in the morning. As Howard and I continued on our way, a strange incident occurred in which we both became separated after a bunch of locals dashed passed us. Howard managed to eventually tell me a bit later that at the time I was investigating a shop, a strange man appeared out of the shadows and darkness and he seemed to be unable to speak. This was then followed by the appearance of a group of similar men who all suddenly and mysteriously ran off. At the time I just thought that Howard was merely a bit tired. Back at the hotel I decided to question Anna about the note and whatever else was going on. Anna did try to deny everything until she let slip that the man who gave her the note was now dead and that if anyone were to find out what she did she would be in trouble with Dr Macklin but then corrected herself by using the name, Boronski. At that moment I began to wonder where had I heard the name Macklin from…..
My thoughts were suddenly and rudely intruded upon by the ringing of the phone. It was that knuckle-head Koerner confirming the details of next day’s visit with Dr Boronski. During our meeting with Boronski the next day, we finally got him to admit that he was indeed, Macklin, a famous biologist who left the West when he became depressed and frustrated over his work in longevity. He then went on to claim that he was now just the local school principal. Dr Boronski soon introduced us to Paula Vendt who was the school’s senior tutor. who gave us a tour of the school and the preparations for the upcoming cultural festival. During the tour, we met that obnoxious boy, Hugo, who it turned out was the school’s most gifted student. Figures! Hugo had been working on this large mask and as he showed it to us, Howard was stunned to see a resemblance between the mask and the facial appearance of the group of men he told me about from the previous evening when we became separated. Later that day Howard and I witnessed a funeral and we figured it was for the man who wrote the note that Anna passed to us. 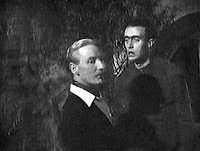 We then decided to do a bit of sniffing around and eventually located the deceased man’s widow, Frau Bikstein. When we showed her the note she readily authenticated it, and proceeded to tell us about the experiments her husband was doing with Dr Boronski. Frau Bikstein wouldn’t give us any more information out of fear but she did give us access to a diary from Boronski that her husband apparently stole from the laboratory. The diary gave us valuable insight into the kind of experiments Boronski was conducting. His experiments involved exposing young immature brains to gamma radiation enabling both geniuses and imbeciles to be created at will. The gamma rays were supposed to be able to accelerate the brain’s development and allow its full potential to be used. We learnt later from young Hedda that our little bully boy Hugo was throwing his weight around by criticizing Hedda for playing what he saw as weak sentimental music and telling her father, Lockner that he had no rights because the state was raising Hedda and that he had better beware of the likely consequences of his actions. 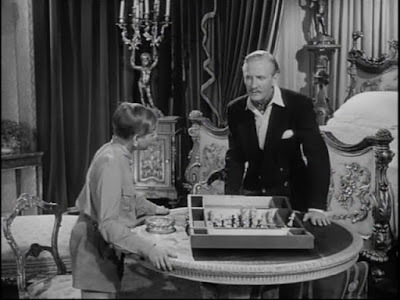 Little wonder that Hedda and her father were making plans to escape to Vienna. Thank goodness for the existence of countries that are prepared to take in those from elsewhere who face threats to their lives, liberty and well-being! 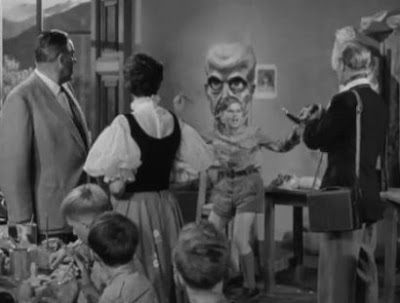 We also learned that Boronski had instructed horrible Hugo to retrieve a photo that Howard had taken of Hugo’s mask. In fact it was Howard who caught Hugo in the act of sneaking into the house to locate where the photos were being kept. Hugo acted all innocent in front of Howard and tried to deflect attention away from what he was up to by taking about chess. Clever move kid! In the meantime, I came across Paula Vendt riding a horse and began questioning her about what was going on at Boronski’s laboratory. It turned out that her father was a friend of Boronski, and had come to Gudavia to work for him. When I expressed doubts about her support for Boronski’s research, she became defensive and galloped off. Paula was sure one gal I’d like to ride off into the sunset with! The next part of our adventure I’m a little bit embarrassed to tell you about. You see, ladies’s man Howard spotted Hugo and sprinted after him in order to retrieve the photo that was taken. Our super-fit hero managed to catch Hugo at a playground. He then admitted to Hugo that he had the negative and confidently refused to give it to the young hoodlum. 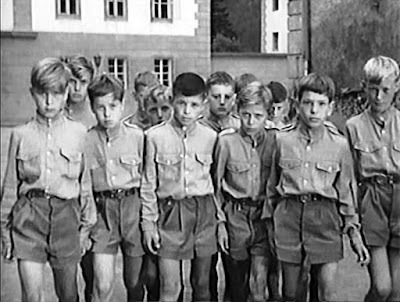 At this point Hugo called on the services of a gang of ……..school boys……yes, you read it correctly…..school boys who then proceeded to make mincemeat out of Howard and take the negative from him. Well, Howard old boy, that is one story that won’t impress your lady friends! Late at night I spotted Paula and followed her to the spot where Lockner had been killed by being thrown off a cliff. 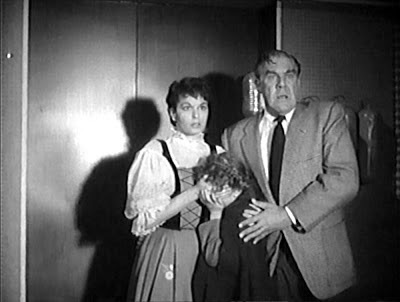 It soon became apparent that Boronski and his goons were behind this incident after Boronski learned about Lockner’s intentions to leave with his daughter. I tried to question Paula but she felt that I was merely there to write a story rather than being interested in helping. I was soon able however, to catch up with Boronski and show him Lockner’s lifeless and mangled body at the bottom of the cliff, He acted as if he didn’t know anything about it so I told him that if anything was to happen to Hedda, I would come after him. After issuing this threat to Boronski, he signalled for his goons to chase after me. I barely managed to escape until my pursuers were called off by Boronski. Next morning it transpired that Boronski ordered his lap dog, Koerner to prohibit all public gatherings and to cancel the festival. I managed to confront Koerner in the street and demanded to know where Hedda was. As a crowd gathered around us, I informed them all that it was Boronski who was behind the murders and that it was Koerner’s function to conceal the truth. That night, a new mood of civil disobedience bubbled to the surface with the population ignoring the official proclamations not to gather in the street. They were determined to have their festival. 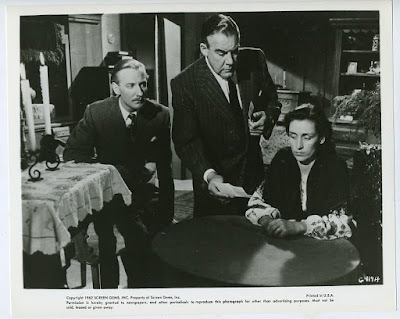 Meanwhile, I tried looking for Howard at the hotel and couldn’t find him, so I went back out into streets and met up with Frau Bikstein who then led me to a hiding place where I saw Paula. Paula was now determined to help me bring Bronski down. What a gal! I learnt from Paula that Hedda was being held in the castle, but before we could decide on a further course of action, we were discovered by the authorities. After a brief melee, we managed to escape by mingling in with the festival goers on the streets. Suddenly good old Howard popped up driving a car which we used to drive to the castle, well almost to the castle seeing as a puncture forced us to abandon the car along the way. As we proceeded to walk with alacrity, the car exploded! No coincidence there! Realizing the lengths that Boronski and his boys were prepared to go to be rid of us, I decided to send my athletic pal Howard back to town for help, while Paula and I continued on to the secret labs. I realized then just how funny Howard looks when he runs. Arms and legs going every which way!! It wasn’t long before Paula located Hedda but Boronski soon returned to conduct an experiment while I had to hide in a dark corner. Thankfully Paula made her way to me with Hedda. As we were close to leaving the castle, we were confronted by…you guessed it….Hugo. Paula tried to talk Hugo out of setting off the alarm by informing him that she was his sister and that it was Boronski who had killed their father. That heartless little so and so wouldn’t listen and he set the alarms off. The three of us found ourselves now trapped inside a control room and we were given an ultimatum by Boronski: Our lives in exchange for Hedda’s. To assist with our decision, Boronski explained the Gamma ray process to us and then proceeded to turn the instrument on us. He thoughtfully informed us that we would suffer extremely before our brains were shrivelled. Our agony increased as Boronski continued to intensify the ray leaving us only with seconds left to live. I learned a bit later that Hugo was unable to deal with what was taking place and was ordered by Boronski to go to his room. It turned out that when Hugo spotted Howard with his reinforcements entering the castle, he warned Boronski and as Boronski climbed the stairs for a better look, Hugo pushed him, causing the doctor to fall. Hugo then triggered a series of explosions causing the whole area to be engulfed by fire. Meanwhile, I managed to recover and help Hugo who was being attacked by one of Boronski’s goons. It turned out that Boronski had not been killed by his fall as testified by the fact that he set about attacking me. After a struggle, I finally managed to eliminate Boronski by pushing him into the flames of the raging fire. 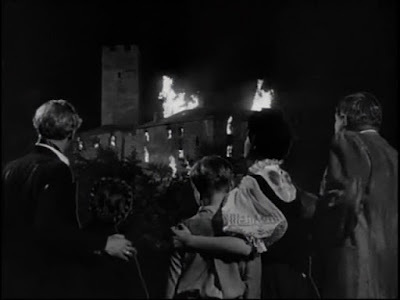 We all managed to get out of the castle just in the nick of time as the entire edifice of Boronski’s abomination was consumed by flames and rendered asunder by a series of explosions. And so good reader on a more serious note to end this piece, a little land languishing under the iron grip of dictatorial rule threw off its shackles and became a free society. 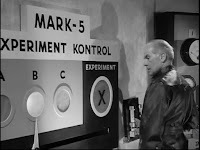 It serves as a warning to us to beware of those powerful Boronskis who would seek to use any means at their disposal such as the manipulative and controlling power of technology, the use of fear and the tools and agencies of oppression in order to gain and maintain control over their societies’ populations. The question remains: Do we allow ourselves to become their compliant "zombies" or do we maintain our humanity and dignity by saying “NO!” and by resisting? 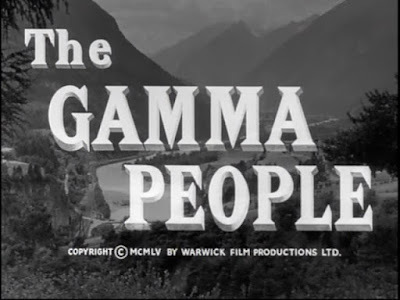 It is very difficult to determine exactly what The Gamma People is aiming for: suspense and terror; sci-fi with socio-political commentary; comedy involving the interactions between the unlikely looking heroes, Mike Wilson and Howard Meade; or action with its frequent fight and chase scenes. It’s very hard therefore for the viewer to see this film as having any kind of real credibility and probably helps to explain its obscurity. The standout character in the film is probably the despicable young genius, Hugo played by Michael Caridia. We get shivers just by witnessing his ability to inspire terror in those around him as in the piano scene when we are first introduced to him and later during the chess playing exchange between him and Howard. Director John Gilling’s other films include: The Flesh and the Fiends (1960); The Pirates of Blood River (1962); The Brigand of Kandahar (1965); Blood Beast of outer Space (1965) and his last film, Cross of the Devil (1975). Gamma radiation is electromagnetic radiation of an extremely high frequency and consists of high-energy photons. They are produced by the decay of atomic nuclei as they transition from a high energy state to a lower state known as gamma decay. They can also be produced by other processes. 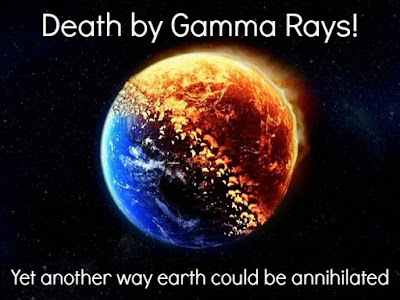 Natural sources of gamma rays on Earth include gamma decay from naturally occurring radioisotopes, and secondary radiation from atmospheric interactions with cosmic ray particles. 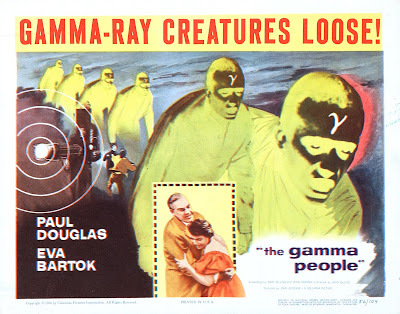 Gamma rays are biologically hazardous and could even pose a threat to our entire planet! French physicist, Henri Becquerel in 1896 discovered that uranium minerals could expose a photographic plate through a heavy opaque paper. He concluded that uranium emitted some invisible light similar to x-rays which he termed, "metallic phosphorescence.” What he indeed found was gamma radiation being emitted by radium-226 which is part of the uranium decay chain and commonly occurs with uranium. Paul Villard, French chemist and physicist also discovered gamma radiation in 1900, while studying radiation emitted from radium. The term "gamma rays” was coined by Ernest Rutherford in 1903. Gamma photons travel at the speed of light and can pass through many kinds of materials, including our own human tissue. 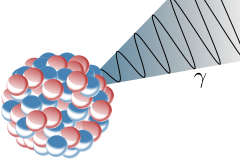 Materials, such as lead which are very dense are used as shielding to slow or stop these gamma photons. Gamma rays have the smallest wavelengths and the most energy of any wave in the electromagnetic spectrum. Hot and energetic objects in the universe such as neutron stars and pulsars, supernova explosions, and regions around black holes produce gamma rays. Here on Earth, gamma waves can be generated by nuclear explosions, lightning, and radioactive decay. Even the Incredible Hulk owes his existence and anger management issues to an accident involving gamma rays!